"Summer online classes help undergrads stay on course and “in the groove”" inform Unified Media Advertising. As summer approaches, taking summer classes may be the last thing crossing many students’ minds. But taking classes online during the summer months offers unique opportunities to blend learning and leisure—and staying on course to graduate. 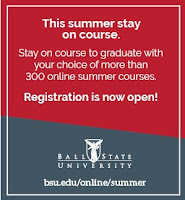 This summer, students can choose from more than 300 online courses, including ten- and five-week courses that are accelerated to fit into the summer break. 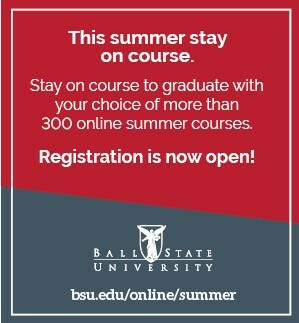 Several of Ball State’s university core curriculum courses are offered as five-week courses in the summer. 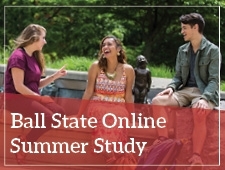 For undergrads who have not ventured into distance learning, online classes readily fit into a summer schedule because most classes do not meet at fixed times. Typically, students maintain contact with their instructor and classmates each week and complete assignments, readings, exams, discussions, group projects, and other activities. The online and distance education marketing staff likes to say that online classes travel well. As online enrollees, main campus students who are going home for the summer will still have access to professors, library services, the Writing Center, the Learning Center, the Technology HelpDesk, and all the services used by students on campus. She says it also helps students open up their schedules to pursue internships during the fall and spring semesters. Approximately 5,ooo main-campus students supplement their schedules with online classes during fall, spring, and summer semesters.